Here's the video game artbook for the Nintendo 3DS game Code of Princess released in 2012. 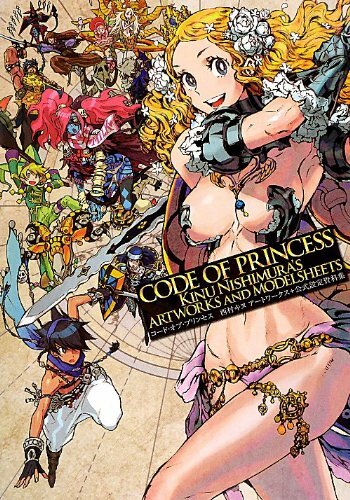 CODE OF PRINCESS 西村キヌ アートワークス+公式設定資料集 is a 112-page paperback, slightly larger than A5 size. It features character designs mainly and the character designer is Kinu Nishimura (西村 キヌ). You might have seen some of her artworks for Street Fighter as well. I really like the character designs which I feel are a bit zany in a good way. The illustrations are beautiful and include the multi-character splash pages which seems to be drawn traditionally judging by the ink strokes, anime style art as they appear in the game, and sketches of the characters. The downside is the coverage on enemies don't look as complete as the characters. Also included are the stories and quest list, and even some combo suggestions. The staff interviews talk about the development process. There's also a section where they talk about the creation of the Code of Princess statue for Princess Solange which looks really great. All the text are in Japanese. Nice book to get if you like character designs.